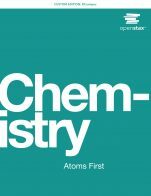 Chemistry: Atoms First is a peer-reviewed, openly licensed introductory textbook produced through a collaborative publishing partnership between OpenStax and the University of Connecticut and UConn Student Government Association. This title is an adaptation of the OpenStax Chemistry text and covers scope and sequence requirements of the two-semester general chemistry course. Reordered to fit an atoms first approach, this title introduces atomic and molecular structure much earlier than the traditional approach, delaying the introduction of more abstract material so students have time to acclimate to the study of chemistry. Chemistry: Atoms First also provides a basis for understanding the application of quantitative principles to the chemistry that underlies the entire course. The Chemistry - Atoms First cover is copyrighted by Rice University. It is not subject to the Creative Commons license and may not be reproduced without the prior and express written consent of Rice University. Chemistry: Atoms First (OpenStax) by Edward J. Neth, University of Connecticut, Paul Flowers, University of North Carolina at Pembroke, Klaus Theopold, University of Delaware, Richard Langley, Stephen F. Austin State University is licensed under a Creative Commons Attribution 4.0 International License, except where otherwise noted.